It’s entirely possible to retrieve bulk Australian Stock Exchange (ASX) data directly into R. This not only allows easy statistical analysis, but it empowers one to build data pipelines that employ advanced data transformations and machine learning. I couldn’t find any information or sample code myself so I pieced it together myself, it is straightforward to get data for one company, but less so for many. I decided to write this guide so others don’t have to repeat what I already did. I’ll leave the analysis of ASX data to others, or perhaps a later post. We’ll be using the excellent quantmod package and yahoo finance service. It should be noted that I used the following code in functions, which I am not doing here for clarity, however they can be easily be converted if you want to build something more extravagant. There is a file hosted on the ASX website that contains all companies listed on the Australian stock exchange. We could manually download it and import it into our R environment, or we could simply import it directly into R, since the read.csv also reads URLs. 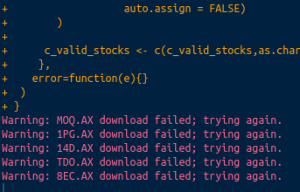 Notice in the code block below, we append .AX to the ASX code, this is the “ticker” format that Yahoo finance uses. 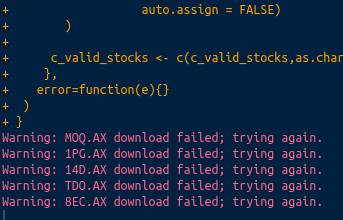 Before looping, we define an empty vector c_valid_stocks, we’ll iteratively populate this vector with the loop. The tryCatch function prevents the loop from breaking when there is an invalid stock. De-listed companies appear as warnings. We define the date range of the date with arguments from and toin the getSymbols functions. These can obviously be altered to whatever you need. We need to rename the returned data. The getSymbols function is designed to return data on one stock at a time, and it includes the stock name in the column names of the returned data, making it difficult to rbind. That’s it, I hope this has helped someone to begin analysing ASX data in R, let me know in the comments.